Mennonites settled in this area soon after Oklahoma Territory opened by run April 22, 1889. Their first mission activity was among Indians. This colony was southern most for Mennonites along Chisholm Trail. Farmers of Swiss from Berne, Ind., German and German Russian decent were urged to settle here in order to establish the Christian faith on the frontier. Approximately 6.5 Miles North of El Reno, Oklahoma, Canadian County, on U.S. 81 on the left side of road by a Cemetery. Note: The church mention on the marker was no longer there. Just the Cemetery and the Marker. Addition Note: I found the church, it has been moved to El Reno, OK and is on display at the Canadian County Historical Park. Organized 1891 and built in 1893 by twenty-seven charter members, including some of the personnel form the Mennonite Mission Industrial School for the Cheyenne and Arapaho Indians at the Darlington Agency and Mennonites who settled in this area soon after Oklahoma Territory opened by run on April, 22, 1889. This colony was southernmost for Mennonites along the Chisholm Trail. Farmers of Swiss, German and German-Russian descent were urged to settle here to establish the Christian faith on the frontier. 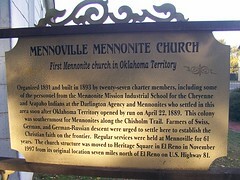 Regular services were held in Mennoville for 61 years. 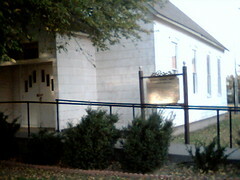 The church structure was moved to Heritage Square in El Reno in November 1997 from it original location seven miles north of El Reno on U.S. Highway 81.